Encuentra tu propio paraíso tropical en Goff's Caye, una pequeña isla rodeada por el cálido azul del Caribe y la barrera de coral de Belice. Ubicado a solo 30 minutos en bote de la ciudad de Belice, es una forma fácil de escapar de la civilización y pasar el día disfrutando de las playas de arena blanca y buceando entre coloridos peces y jardines de coral. Disfrute de las comodidades de las islas más grandes sin multitudes en este feliz viaje de un día a Belice. Relájate y escapa de las multitudes en el apartado Cayo de Goff. Disfruta de un ponche de ron y disfruta de un entorno de playa tranquilo y rústico. Incluye transporte en barco desde la ciudad de Belice hacia y desde la pequeña isla. Goff's Caye was a 30 minute boat ride from the city of Belize. My husband and daughter said that the snorkeling was the best they've experienced. I stayed and enjoyed the clear, warm water, beautiful sand, and cold drinks. Our crew was incredible! My only advice is to remember that Belize is 2 hours behind the cruise ship's time. We got there at 9am, like our voucher said to do, but that was actually 7am their time. So, we waited a couple of hours before we got to leave. We also had to make sure that they understood that we HAD to be picked up by a certain time in order to catch the last tender before the cruise ship left. That was a little scary, but Caesar kept his word and got us back just in time. I HIGHLY recommend this excursion. Please don't judge Belize by the city. Get away to one of the beautiful cayes. Captain Mark and Clayton were THE BEST!!!!! So hospitable, so kind, so helpful! On our boat rides to/from Goff's Caye we saw manatees and Mark and Clayton shared many interesting facts about Belize. 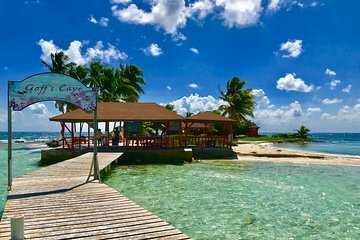 Goff's Caye is a tiny island that is bursting with good vibes, yummy rum drinks, island music, delicious food, and friendly staff. I can't wait to return! I did this tour as an excursion on a Royal Caribbean Cruise and this was easily the best part of my trip. We were taken to the beautiful small island of Goff's Cayne Island and it was absolutely breathtaking. The snorkeling was fun to do and the island was a beautiful spot to be. Mark and Clayton were incredible guides and made our trip the best it could be. I would highly recommend this experience. Despite the wind and rain we had a great afternoon at Goff's Cay thanks to our guide, Marc. We were met at the pier by a guide who walked us to our meeting Point, where we boarded our boat and met the crew. We were in a small group of 10 with three crew members who kept the conversation going and provided us information about Belize. They did their best to make our experience positive from beginning to end. The snorkeling was great even though it was overcast and rainy and the water was nice and warm. Getting into the water may be challenging for some as it requires sliding off the side of the boat into the water. We saw lots of coral and fish and once snorkeling back to the island were able to purchase food grilled right in front of us. I highly recommend this tour to anyone who enjoys snorkeling at any level. It is about a three hour excursion which leaves time to shop in Belize City before heading back to a cruise ship.